At the radio station in Humain, operated by the SIDC, a solar burst was detected. 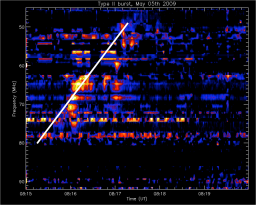 On May 05, 2009, scientists from the SIDC noticed an enhanced solar radio signal. The burst lasted nearly 3 minutes and is seen as a bright line in the diagram. The color in the diagram is related to the intensity of the signal. This is a so called type II radio burst. It is a shock in this particular case produced by a coronal mass ejection, a CME. 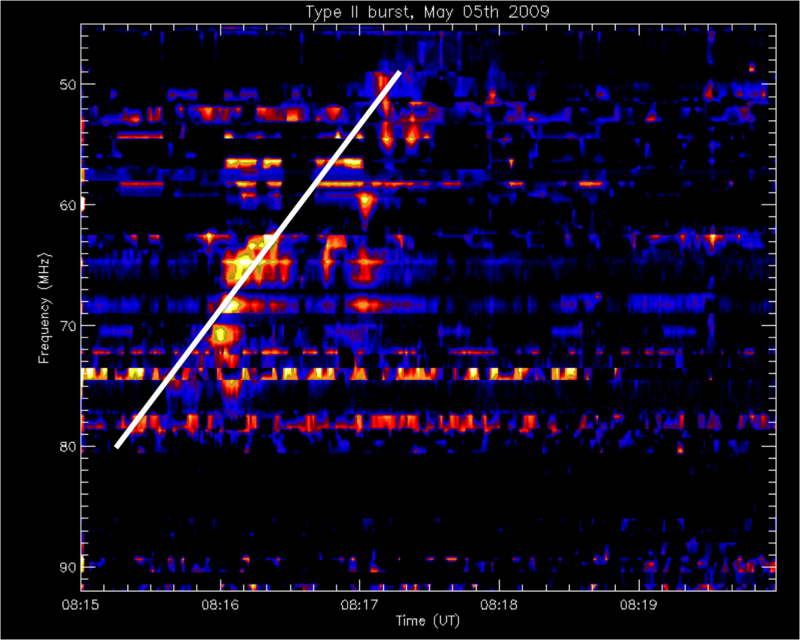 The shock in front of the CME triggers the radio emission. The frequency of this emission is a measure for the distance from the Sun: the higher the frequency, the closer to the Sun. When the frequency decreases with time, the shock propagates away from the Sun. How fast the frequency decreases is a measure of the speed of the shock. STEREO-B did see the eruption as an event just behind at the east limb of the Sun from its point of view as shown in the series of pictures. LASCO/SOHO had not enough observations during this time period. The beacon data from STEREO-A are not available. Beacon data are first, quick data. They are not used for scientific research but are usefull for forecasting space weather. STEREO-A should have seen the event as a backward halo CME.